Welcome to the Snapchat Influencer Q&A series, where you can learn from the masters as we deconstruct the techniques used by Snapchat influencers and marketers. Today we are talking to Stephanie Graham who an artist, filmmaker and photographer. 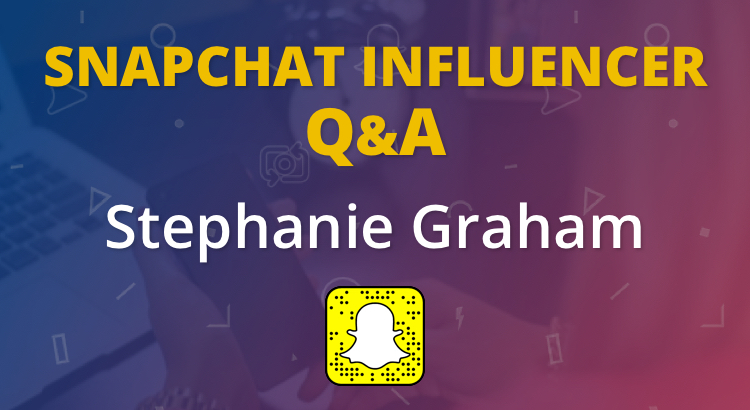 In the interview, Stephanie talks about how she incorporates Snapchat into her art practice, the difficulties of growing a Snapchat audience and her advice for overcoming them. Hi Stephanie, great to meet you. Thanks for taking the time to share your knowledge with us. Could you tell us a bit about yourself and what you do? Hi Jason!!! Yes, I’m excited to be here and thankful for this opportunity. Snapchat is hands down one of my favors social networks so thanks for having me!! So.. hello everyone! I’m Stephanie Graham, and I’m an artist, filmmaker, and photographer living and working in Chicago. I create work around the themes of race, subculture, and womanhood. How do you incorporate Snapchat with your work as an artist, filmmaker and photographer? I like to think of my Snapchat as a mini behind the scene documentary of my art practice. It is a space of what is going on with me and my life. So things I snap would be something like me preparing for an exhibition, visiting artist friends, on set for a shoot, gallery openings and things like that. I’m even known for a good rant and snaps from parties. I try to make it a full circle. What do you find difficult about growing and maintaining your Snapchat following? The biggest difficulty for growing my account is creating something genuine to share. I don’t ever want to post something for the sake of posting. I think my snap friends can tell when I’m reaching for something and I never want to do that. So inspiration can sometimes be a challenge. Consistency is King, but sometimes it’s just hard to find the inspiration LOL. So the biggest thing to me is being engaging and consistent. I would love to grow my account. But even with discovery tools, I still have to get someone interested and I also have to be interested in them. I talk to everyone I follow. It’s not a one-way broadcast. I want to be into what my snap friends are into also so it takes awhile and I understand that. What advice would you give to other entrepreneurs who are just starting to use Snapchat? Hmmm you know, prompts always help me. If I’m going to do a series of something, I think ‘okay what can I say and show that will be fun and quick.’ Because once you start snapping about something you have to commit and see it through the end. So if I say okay, I’m going to show my audience something, or get their opinion on XYZ, I am always thinking about how I can make that happen. This is always helpful. So for anyone starting out looking around and thinking about what they can teach their audience, I would recommend doing it in 3-6 snaps. This helps you have a focus and not get overwhelmed. What effect has Snapchat had on your personal brand? I’m not sure, but I think I have made a lot of people interested in the art world through my snaps. People Snap me about art they have bought, or art shows they are at. Even if it’s just a local art fair, and that makes me smile. So being able to identify me along with the art world I think is super cool. Who are your favourite people or brands to follow on Snapchat? Will Kurk (williamkurk) is a musician who has his own band that he performs and tours with. He also plays on many other bands that take him all over the world. What is cool about him, is that even though he is all over the world, you can also see him snapping where he is playing songs for children at an assembly. It makes you think ‘hmm okay he will play for anyone, anywhere’ lol and that’s really neat!! He also snaps all this yummy food. His account is really fun. CrazyKaleLady is a great account about nutrition. I’m not sure if she used to be or still is, but she battled with diabetes and turned her life around. So her account is inspirational with her journey and sharing eating habits. I’ve learned lots from her and she is super engaging. I talk to her about everything even outside of a healthy eating. I’m on Snapchat of course at yourgirlstephg. I know this is easier said than done, because I can get wrapped up in this sometimes, but don’t worry about numbers. Just worry about making sure you are sharing who you are and all that other stuff will follow.